Just kidding…but, it made you look! 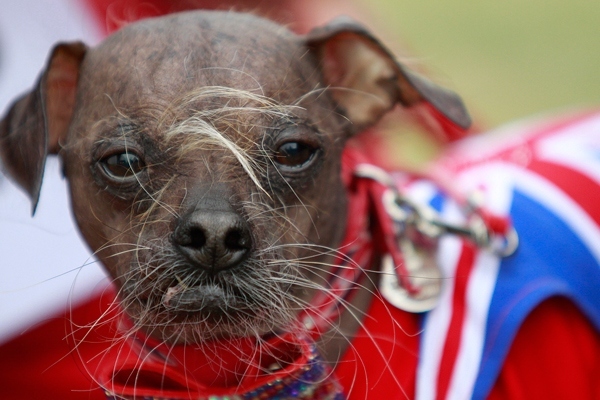 A Chinese crested's short snout, beady eyes and white whiskers earned it the title of World's Ugliest Dog at the annual contest in Northern California on last Friday. Competing for fame, $1,000 and a year's worth of dog cookies, Mugly won the honor by beating out 28 other ugly dogs from around the world. The 8-year-old rescue dog from the United Kingdom will also be invited for a photo shoot and will receive a VIP stay at the local Sheraton. "I couldn't speak when they announced Mugly's name," said Bev Nicholson, the dog's owner. "I didn't know which way to look. I was shaking as much as the dog."